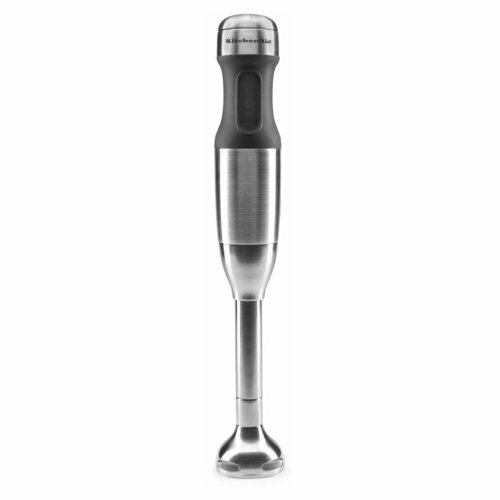 KitchenAid 5-Speed Hand Blender with the Industry's First Interchangeable Stainless Steel Bell Blade Assemblies and FIRST EVER Removable Pan Guards. Change easily between different types of blades with no hassles or tools. The first ever removable pan guard attaches easily to the bells and helps prevent scratching on cookware. Bell blade assembly covers protect the blades when not in use. Blend, Puree, Chop, Shred, Mince Froth/Mix and Whisk/Emulsify/Aerate - Easily blend smoothies, chop nuts, froth cappuccinos, shred vegetables or whisk egg whites with greater control. Features: Speed Control Dial - Variable speeds provide greater processing control that adjusts to handle a variety of foods, beverages and soups. 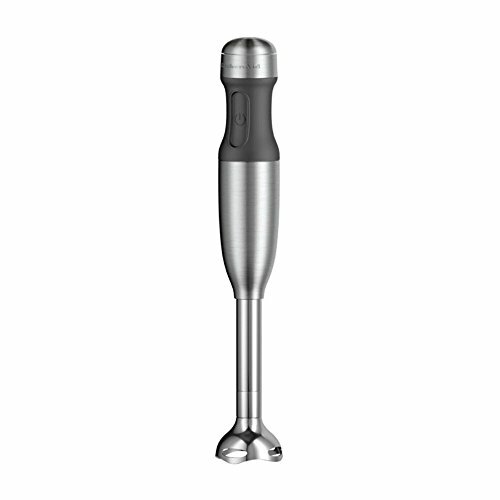 One-Touch Power Button - Activate the Hand Blender by pressing and holding the POWER button during blending. To stop blending, simply release the power button. Motor Body - Designed for a comfortable, non-slip grip. Powerful DC Motor - Provides a powerful blending action and is designed for quiet, long-life operation. 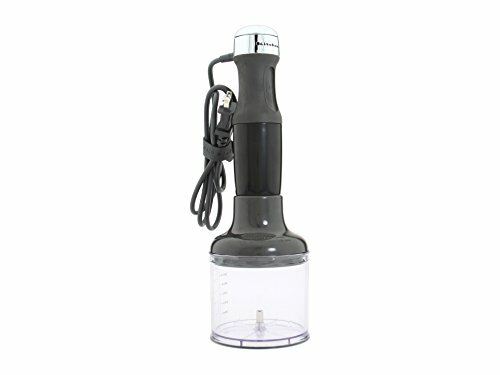 5-ft. Power Cord - Long enough to take the Hand Blender to the cook-top or work area, the Power Cord is rounded with no grooves for easy clean up. A silicone cord strap is included for convenient cord storage. 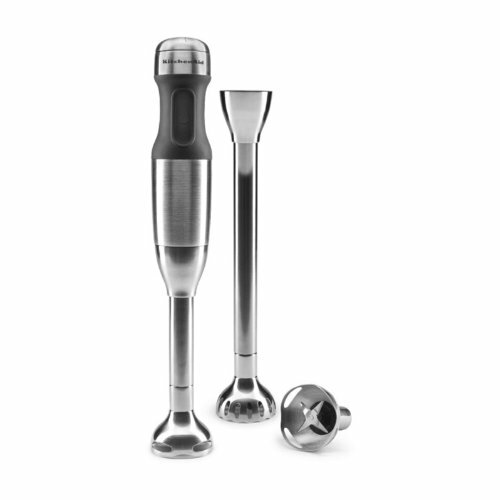 Twist-Lock Stainless Steel Blending Arm - Simply attaches onto the Motor Body with a simple twist and rotate to lock into place. Use the Blending Arm for Blending Pitcher, attach the Bell Blades for blending in deep pots and containers. 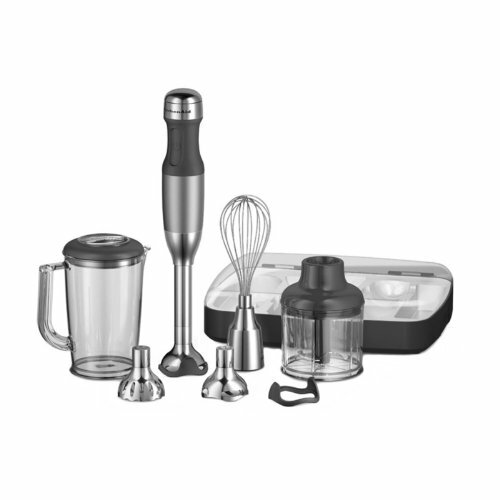 Comes with the following attachments: Whisk Attachment; Chopper Attachment; a 4-cup BPA-free Blending Pitcher; Bell Blades; Pan Guard; Bell Guard; and Storage Container.